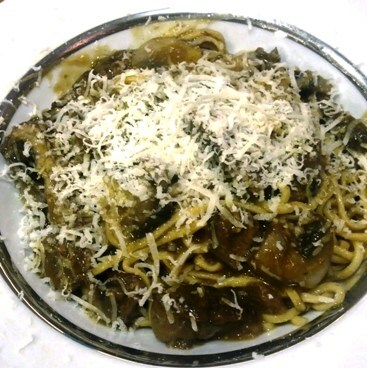 Spaghetti with a Decadently Rich Beef Shank Jus. Honestly, One of the Best Pasta Dishes I’ve Ever Made. Every bite was perfectly covered with this thick meaty gravy. Oh, so good! Imagine this: Freshly made linguine, cooked to al-dente perfection (mine was a tad over-cooked, but we’re imagining here) drenched in a thick sauce that’s made of the braising juices of beef shanks (with all the melted marrow) cooking in wine and stock for almost three hours, thickened with a buttery blond roux, accented with slivers of the melt-in-your-mouth beef and some mushrooms, pan-fried and then finished in the sauce, all under a big heap of freshly grated Parmesan cheese. Omygod. Lolwut. I’m dying here just remembering this plate. A caveat though, my wife thought it was a bit much, and would’ve preferred something zingy or zangy to freshen it up a bit (I respectfully disagreed, but I mention this in the spirit of full disclosure). So in conclusion, if you want to try the beefiest, richest pasta to end all pastas, you’ll find the recipe after the jump. About 1.0-1.5kg of thick veal or regular beef shanks, so about 2 beef shanks and 4 veal ones, cut to at least 5cm thick. On a medium high heat, heat some olive oil (about 2 generous lugs from the bottle) in a wide dutch oven or a deep pot (That can snugly fit the shanks without any overlap or too much space between) that can go into the oven. Once nice and hot, place the shanks and brown all over, should take about 15min. Once nicely and evenly browned, remove the shanks and reserve on the side, add the onions, garlic, carrots and celery and cook for a few minutes until softened but not colored. Add the tomato paste and cook it for a couple of minutes, before returning the shanks into the vessel and pouring in the wine then stock. There should be enough stock to cover the shanks at least 2/3 of the way up. Add the thyme, season with salt and pepper and place the vessel in the oven to cook (covered) for at least 2 1/2 hours, until the meat falls of the bone and can be cut with a spoon. Halfway through, turn the shanks over. While the meat is cooking, in small pan with some olive oil and a sprinkle of freshly chopped thyme, cook the mushrooms for a few minutes (5ish) until they release most of their liquid but not too limp. 1. Adding the mushrooms is as simply done as it said, basically just dump the sliced mushrooms into the saucepan. 2. Thickening with a roux, not quite as simple as the mushrooms; a roux is a mix of equal parts fat and flour, cooked together and added to a sauce to thicken it, discussed in greater detail in this old post. Make about 80g of roux as defined there, and add one teaspoon at a time to the sauce. You probably won’t need more than 2 teaspoons to get it to a consistency just about the same as that of cooking cream. Whisk in the roux making sure it is well dissolved. 3. Add the cream and whisk, re-adjust seasoning after the cream is added if necessary. 4. You’ll need to have made about 350g of linguine using this recipe for fresh pasta dough, once cooked in fast-boiling water for no more than 2 minutes, add the pasta to the sauce along with the meat of half of the shanks sliced into slivers. Mix the paste into the sauce and serve, topped with freshly grated Parmesan cheese, you will thank me for this 🙂 Hope you enjoy. Previous Golden Kiwi Baked Custard Tart with a Dark Chocolate Ganache. Next Pan Fried Grouper with a Lemon and Clam Beurre Blanc Sauce, Diced Tomatoes and a Bresaola Crumble.